Master of Malt (@masterofmalt) and Whisky Magazine (@whisky_magazine) have come together for an epic battle of the blends. With none other than Dave “The Rummager” Broom (@DaveBroomwhisky) v Neil “Copper Dog” Ridley (@NeilDram). So what do we know about these blends? Honestly, nothing, not a jot. It’s a blind tasting, we don’t know what’s in each dram or who blended them. Enough chat and more drinking. Since we wrote our notes The Whisky Magazine today announced the winning Blend, and it was Blend A, which was created by Neil “Copper Dog” Ridley. An outstanding result, but with no shame at all in being second for Dave “The Rummager” Broom, Blend B was a very worthy runner up, but demanding more time and attention then the easier drinking Blend A. This is one fruity dram, as soon as I broke the wax seal and lifted the top, I was confronted with juicy peaches and soft apples. There are buttery soft fairy cakes with silky soft lemon butter cream and icing sugar dusted on top. Summer warmed hay and freshly mowed lawns with a gentle floral note of geranium, combined with sticky heather honey, and condensed milk boiled until it’s turned into toffee. Given a little time in the glass red berry notes come through, strawberries, raspberries, and the tiniest hint of pineapple and creamed coconut. Burnt sugar is first on the palate, the slight bitter edge appears, before it relaxes into an almost cereal and warmed milk sweetness. There’s a little spice on the palate, with freshly cracked black pepper and some cinnamon bark. There’s pink and white coconut ice and dream topping, the fudge notes from the nose making a welcome appearance. Strawberry laces and fruit salad sweets combine, all those tropical notes become slightly artificial but more mouth-watering. It’s fresh with lemon drops and the apples from the nose baked in the oven with raisins and a sugar crust, petering out to soft butterscotch. Long and chewy, a wonderfully rich mouth coating finish. The burnt sugar crust on a rich, smooth crème brulee, with vanilla pods combining with sweet crème anglaise to make a silky smooth mouth coating dram, which continues to be chewy and comforting long after you finish. It retains a little spice, with baking spices such as cinnamon, nutmeg and ginger, and this brings a little heat and stops it becoming overly sweet, it could easily have become cloying but clever blending has prevented this, and it really is perfectly balanced. The fruit from the nose, is all but gone, however some baked apples and tinned peaches remain which entwine with a chewy, homemade toffee sauce. Well rounded with the sweetness running from the nose to the finish. It starts off incredibly fruity and light but really hits its top notes once the creamy sweetness comes through. There are rich, sweet tannins which leave this lingering on and on. If you like a sweet Speyside whisky then this is definitely the one for you. This is one moreish blend, and easily a session bottle. I don’t know who made it but I know I want it, Blend B would need to be pretty outstanding to beat this. Toffee sweetness cut with lime zest and kiwi fruit. Bursting with uplifting lemon juice, and lemon sherbet and sharp lemon drops, it’s fresh and effervescent. A green mossy note combines with rich oak and pear drops and a hint of resin. Grapefruit is drying and bitter. A sour vegetal note, think digging over the allotment, and tomatoes growing in a greenhouse, which are still slightly green. It’s both sweet and earthy at once. There’s mescal and salt, and if you work hard there is a touch of smoke puffing away in the distance, which combines with the lemon, salt and becomes more coastal, and briny, seaweed which has spent all day drying in the sun. Sweeter than the nose suggested, dark treacle, Brazil nuts and walnuts with espresso and burnt toast crumbs. Oak is rich, and drying, there is a distinct dampness with autumn leaves and early morning frost on crisp grass. Toasted pine kernels and bitter cabbage leaves almost mask rich silky baked figs but they are there in the background with juicy brambles and gritty cocoa nibs. A drying, quite bitter finish. Coffee grinds, earth and a distinct nuttiness really take over the palate. There is a hint of sweetness but it’s pushed to the back of the palate. Dark brambles, figs and liquorice combine and lift this slightly, but the bitter notes continue to push through. The smoke is more apparent on the finish, and when this combines with the smoke it brings a distinctive coastal edge. Not an easy drinker, but very complex, and if you work for it there is plenty to be found. This needs, in fact demands time, to really appreciate it and work through the flavours that are there. Two very different blends, Blend A is sweet, fruity, with a wonderful malty chewy viscosity. A long finish makes and fantastic balance of flavours makes this an easy drinker, it’s definitely one you would throw the cork on the fire. This is very Speyside, with apples, peaches and honey aplenty. A really lovely blend that I would happily drink again and again. Blend B is richer, darker, and demands more time and effort. Bitter with coffee grinds, silky yet drying oak and Brazil nuts. If you really work for it you will find gentle puffs of smoke, which combine with sea spray for a coastal finish. Not an easy drinker, you need to think about this one, its complexity is what will make this a definite hit for one and a definite miss for another. Flambé bananas, lemon window polish, vanilla ice cream, slight hint of smoke. Hot and spicy to begin with, almost overpowering, this dies down and some fruit comes through, strawberries mixed with oranges, next comes some more spice, dancing on the tongue along with chilli powder before dying down with bitter chocolate. Long, hot but very satisfying, this is a whisky that you know when you have tasted it! Slightly medicinal, smoke from a burning fire, creamy like a mild curry. Medium length, some smoke remains along with spices. Both drams are well balanced and both I would like to have as a winter dram, definitely not ones I would have on a warm summers day. 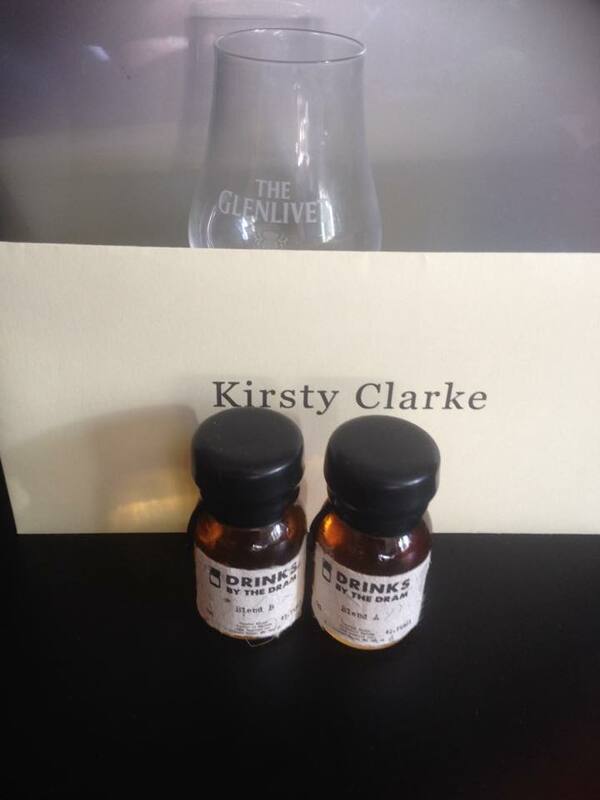 Dram A brings more on the palate than Dram B, however I am getting more smoke with B and I do love a smoky whisky! In conclusion I would have to go for Dram A, it’s spicy hotness and hint of smoke swing it for me, though I wouldn’t call it a session dram, definitely more of a winter warmer. With thanks to both Master of Malt and Whisky Magazine for inviting us to help judge these blends.